Home » What is Your Spending Personality? Ever since I became enthralled with personal finance, I’ve developed a keen interest in spending behaviors, patterns, and triggers. Spending is so much more than just buying what you need. If we all just bought what we need, there wouldn’t be any debt, lifestyle inflation, or a paltry savings rate. But one thing I’ve noticed is that everyone is different. Spending personalities vary from individual to individual. To improve your finances, save more, and spend less, I think it’s crucial that you understand your spending personality. Hi! My name is Melanie and I admit I’m an emotional spender. I don’t spend a lot, or like to shop, but my emotions affect a lot of my spending decisions, which typically means going out to a restaurant. I just had the best day ever? Let’s celebrate at happy hour! On the same token, if I’m having a rough day, the first thing I want to do is go out to eat. Busy and stressed? Forget about cooking, to the restaurant I go. It’s been a painful truth for me to realize this, but since I know this about myself I take active steps to have food already made and having some affordable bottles of wine, so that I can enjoy some frugal fun at home and not just jump to going out. Emotional spenders are driven to spend their money on certain activities, related to certain emotions. I know a lot of shopaholics feel like shopping is a natural antidepressant. Isn’t it nice to have shiny new things, when you are feeling down? It’s key to change your thought patterns that equate certain emotions with certain activities. It’s tough because it’s literally like rewiring your brain. The YOLO spender spends money based on the concept of ‘You Only Live Once’. It’s easy for this type of spender to go overboard on lavish experiences and things all in the name of YOLO. Booked an expensive trip on the credit card? YOLO. New designer wardrobe? YOLO. On one hand, yes, you do only live once. You should enjoy your life and live it to the fullest, but YOLO shouldn’t be a prescription to spend carte blanche. I often find that I’m trying to manage my money and life with the thought that ‘you only live once’ while also recognizing the fact that I could live until I’m 100. If I don’t want to live in a shoebox, or have government support, I need to save now. And so you do you. This type of spending personality is a bit more balanced. They spend when they need to, but always keep frugality at the forefront of their mind. They believe in quality over quantity and are willing to pay more for something that is worth it. The savvy spender spends money on their values. They know that spending on experiences is better than spending on stuff. If this spending personality comes naturally to you, you are lucky! For this type of personality, spending any sort of money, even when it’s necessary is a stressful, guilt-inducing experience. They are a miser and like to cut corners at all costs. You may see them on shows like Extreme Cheapskates or they may be your socially awkward friend that fights over pennies when the bill comes. Usually this spending personality has some sort of fear — whether based in reality of not — about not having enough. This fear is a common money fear for most people, but this spending personality takes it to the extreme. Of course, I’m having a little fun with all of this and I’m sure there are other spending personalities out there. These are just a few that I recognize in my own life and community. 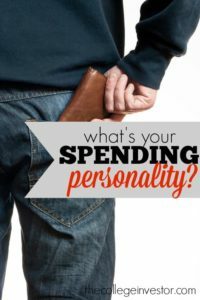 What is your spending personality? Any spending personalities you’d add to the list? Melanie Lockert is a freelance wordsmith, a passionate debt fighter, and frugal lovin' minimalist who writes at DearDebt.com. She devotes 50% of her income to student loan debt and is often dreaming of her next adventure.